From Mess Hall to Bistro: Easy Peach Cobbler, to go please! Easy Peach Cobbler, to go please! Most of us have that recipe we always use for pitch ins and cookouts. Mine is my super easy cobbler. So last time I made it, I thought I would change it up a little bit. But there's not really much you can do with my cobbler recipe, so I figured I would change how it was served. Start off with a jar of peaches, a stick of butter, and a box of Jiffy cake mix. You'll also need small jelly jars. 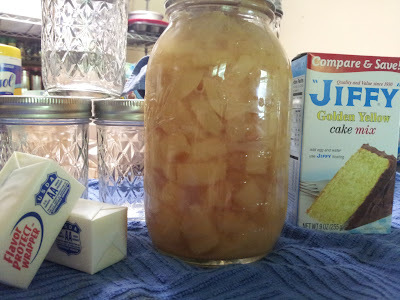 Using a slotted spoon, fill the jelly jars about 1/2 to 2/3 full of peaches. Some of the peach juice/syrup is fine, but not too much. 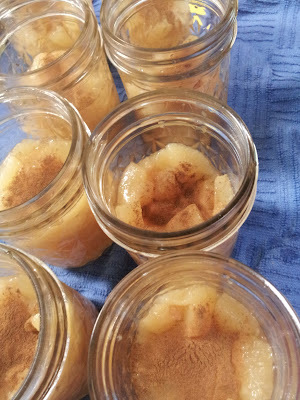 Top each jar off with a sprinkle of cinnamon. Bake at 350 until the tops brown. When the cobblers have cooled, add lids for easy transport. Tip: to make baking easier, I set the jars inside a baking dish for easy transport to and from the oven. To carry them into work, I put the full jars back into the Ball box the jars came in! Sorry there's not a picture; I forgot to take one before I brought them into work. And well, once they got to the office, they didn't stay around too long! These little jars were perfect individual servings during our all day meeting. Those who wanted to heat theirs up could just pop them in the microwave for 20 seconds and have hot cobbler! So, would this work with a regular box of yellow or white cake mix? And did you use 6 jars? I used to make a pinapple upside down cake the same way but in a 9X13 baking pan... loved it... love the little jars though! It works with regular sized cake mixes, but you have to double everything. 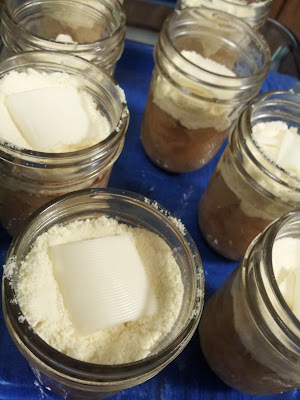 I used 9 jars when I made it, but it really depends on how far you fill them. Fantastic idea! It would be great to take camping too or just out by the bonfire.